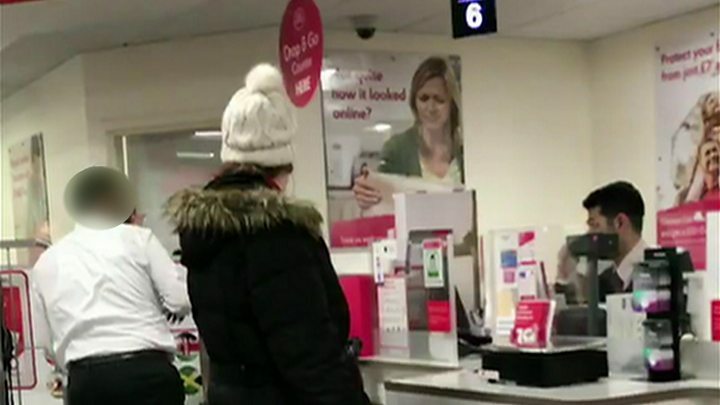 A video of a post office employee being racially abused by a customer has sparked a police investigation. Officers confirmed on Friday they are looking into the outburst at a post office on Camden High Street, north London, on 24 January. Samrat Hanif, who caught the tirade on camera before posting it online, said "everyone was shocked" when a woman began "screaming" at the staff member. The Met said it was looking for other possible victims. Mr Hanif, from London, had been standing in the queue when the woman began shouting at the postal assistant. "All of a sudden I heard she's screaming. I don't know why she was angry," he said. He hopes the sensation caused by his Facebook video, which has had more than 900,000 views, will mean "this lady will never ever do this again". The Post Office's headquarters has offered its "full support" to the team in Camden. "We expect all of our people to be treated with the dignity and respect they deserve and are very concerned by this incident," it added in a statement. Police said the rant "appears to be hate crime-related" and they are making enquiries to trace other possible victims. A spokesman added: "The Met is committed to tackling hate crime in all its forms and we have long since recognised the impact of hate crime on communities. "Victims of hate crime can be assured that they will be taken seriously by the police." The victim, a 53-year-old man, did not wish to make a formal complaint, the force added.